since The Times went and his behind a pay-wall I have not bought a copy, on average I purchase one a week until then and up until a few years ago I had it delivered daily. Like many I know it has largely dropped off of my radar since it decided to hide itself. I appreciate that they have, unlike The Telegraph, failed to find a way to make the internet pay – The Telegraph having set itself up as a marketing organisation and in many ways lost sight of competent journalism in favour of selling books and travel particularly. The articles from The Times placed on this blog are usually mailed to me by journalist contacts with the article in full or I call them and ask them to send me the full article – the following is just a snippet in passing and not worth reading the full article so I have used the abbreviated version to bring it to your attention. It is surprising that Richard Desmond did not foresee Ukip misusing his donation when he acts as their promotion agent and has all but turned his squalid little paper into the Ukip in house Beano! The newspaper proprietor Richard Desmond was “furious” after part of his £1 million donation to Ukip was allegedly used to pay back a six-figure loan from another wealthy individual. Senior party sources claimed yesterday that before the general election in May, Andrew Reid, the party’s then treasurer, called in a loan of about £200,000 that he had made to Ukip, subsequently repaid to him by the party. It would seem Andrew Reid became treasurer to ensure his loan was repaid and has subsequently stepped down – just as Stuart Wheeler would seem to have made himself treasurer before him, to ensure Ukip did not spirit away his donations to the far from trustworthy party leadership! Talking of vanishing donors you will no doubt remember Aaron Banks who has now gone off on his own with a seemingly well funded if very unsound operation trying to promote Leave_The_EU in the upcoming referendum and as for Paul Sykes he seems to have vanished completely apart from claims from some quarters that he has ‘caught’ religion and taken up Buddhism! Its Not Just Individuals Leaving Ukip & Nigel Farage’s Behaviour it includes MEPs, Councillors, NEC members, sponsors & backers! its not just individuals leaving Ukip & Nigel Farage’s behaviour, it includes MEPs, Councillors, NEC members, sponsors & backers! Names like Stuart Wheeler, Paul Sykes, Aaron Banks and the like seem little more than a distant memory as far as Ukip are concerned! More than 15,000 people joined the party in the 24 hours directly after Mr Corbyn’s victory. Total party membership, which is still rising fast, is now around 380,000. The figure is approaching the 400,000 figure recorded at the 1997 election – though the party previously had as many as a million members in the 1950s. More than 100,000 people paid £3 to register as party supporters during the leadership election, many to vote for Mr Corbyn. After his victory party officials had hoped that many would sign up as full members. “I hope they can come with us on the journey to the election in 2020,” newly elected Deputy Leader Tom Watson told BBC One’s Andrew Marr Show. 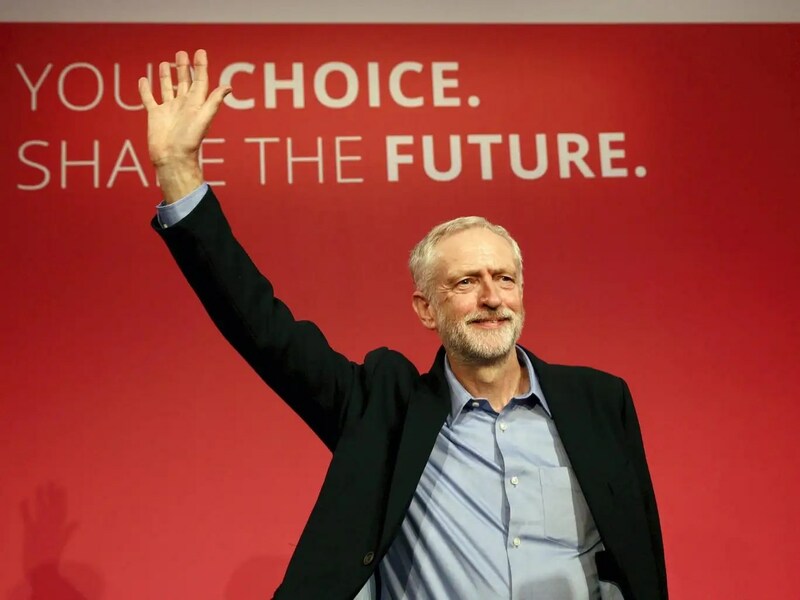 Mr Corbyn was elected as Labour leader by a landslide of nearly 60 per cent of members, supporters, and affiliates. During the Labour leadership campaign Mr Corbyn spoke to packed halls of supporters. Will Barnes Is Just One Example Of The Drift From Ukip With Reasons! Will Barnes’ resignation Is Just One Example Of The Drift From Ukip and With Reasons, which he clearly states! it is becoming ever more clear that the internal squabbling and lack of leadership of any ethical calliber in Ukip is leading to something of a melt down. We have seen MEPs drift away from the cause, the chairman of Ukip Ireland has quit, members of the NEC have left the party and there is a near rebellion amongst many long term members. Meanwhile as Will Barnes states below the party leadership has lost sight of its once ‘claimed’ principles, which were obviously only presented for expediency, have been ditched to promote populism increasingly based upon overt racism and xenophobia – as Will Barnes states: this obsession with immigrants to try to restore Ukip’s flagging cause is likely to prove immensly damaging to the Leave_The_EU Campaign as Nigel Farage seeks any personal publicity/notoriety regardless of the damage he does our Country. As Will Barnes states: ‘he is not alone in quitting Ukip’! Just one of many similar postings seen on the web and reported across social media and the press. Gerard Batten Withdraws His Malicious & Dishonest Lies – This shows what type of senior memberas are like over many years – Who else is implicated in this vile behaviour. “I am extremely relieved that justice and common sense have finally prevailed in this high profile and particularly ill-judged case that has finally been discontinued by the CPS for lack of evidence. I am extremely grateful to my excellent team of top lawyers, Mr Graham Atkins of Atkins Thomson Solicitors, Mr Stephen Vullo QC and Michael Wolkind QC for this just outcome. At the same time, I would like to reiterate that this case, taken as a result of malicious accusations by Gerard Batten MEP, who has, for more than 4.5 years, caused me immeasurable stress and further deterioration of my health. In my view the Police and the CPS should have never taken action. I also miss my opportunity to air my views in court, and to have my team cross examine Batten. I trust that Gerard Batten will be prosecuted, together with his associates in his criminal behaviour – I look forward to Ukip having the integrity to demand the resignation of all who have been associated with his malicious, dishonest and deeply damaging behaviour. Politics may be a dirty game but Ukip has sunk below contempt to have colluded in this case and I look forward to Jasna Badzak’s appeal of the earlier pack of lies concocted by Gerard Batten and others as a pre-emptive strike to try to shelter their own criminality as alleged and reported, in good faith, to what would seem to have been corrupt police officers and brought before a Barrister acting as a Judge who corrupted due process it would seem, in collusion with Batten, his associates and Police. I incline to the opinion that it may be wise of Gerard Batten, Annabelle Fuller, Nigel Farage – Reardon, Galvin and Gledhill and others who are named in legal documents as being implicated, to consider applying for political asylum in Syria either with Bashar al-Assad or ISIS as a safe haven from British justice! I shall shortly be publishing the legal papers, which I have on the matter, as presented by Mr Graham Atkins of Atkins Thomson Solicitors, Mr Stephen Vullo QC and Michael Wolkind QC on behalf of Jasna Badzak. The documentation that names and shames Gerard Batten and his duplicitous cronies which have been accepted to implicate them imn corruption, racism, behaviour likely to incite racial hatred, malicious prosecution and misuse of over £1/2M of public funds – or so it would seem from the documentation which will follow! May I suggest that, in the meantime, you read up on the facts presented on this blog and particularly the Lee Jasper interview, published here in full, and the details from Louise Menche’s excellent ‘Unfashionista’ blog, shortly no doubt to feature in her well informed column in The Sun newspaper. I have held off publishing to date to give the various media the material and a head start – I do know of a number of journalists who have much of the story and are working on a full exposee backed by the legal facts and documents! Are #Ukip & Their #Met Chums Closer To Prison Now? Ukip General Election Failure Glossed Over BUT NEC Member Quits! Ukip General Election Failure was Glossed Over without analysis, Nigel Farage lied about resigning are reasons why ex-Tory Councillor & Ukip NEC Member Quits! A former Royal Borough councillor who left the Conservative Party and defected to UKIP has announced he is leaving the party. Tom Bursnall joined UKIP in 2012 with his wife Catherine, former mayor of Windsor and Maidenhead, while he was councillor for Windsor’s Clewer East ward. During his time at UKIP, the 35-year-old recruitment consultant established himself as one of the party’s most senior officials and was a member of its National Executive Committee. But the Windsor resident said he felt the time was right to take some time out from politics. He said: “There’s a host of reasons why I left the party but overall the party that I joined in 2012 is different to where it is now in terms of direction. “The party didn’t do as well as it could have done in the election and I don’t think there’s been a proper post-mortem. Bursnall also added that he felt UKIP leader Nigel Farage should have stepped down after May’s General Election but maintained the pair had shared a positive relationship. “He (Farage) was very positive for the most part. We had one or two disagreements towards the end and I felt there should have been a change,” he added. it must be particularly gaulling for Nigel Farage that this cartoon, showing that the media has seen through his paper thin self publicity and have clearly got the message of his being no ‘Superman’ in a cape but just a silly little man in a seedy spivs shabby chique coat, made fashionable as a spin off of the ‘Teddy Boy’ era when Saville Row’s aim to issue an Edwardian style of long jackets and were gazzumped by their own cutters and workshops in the East End slums of London. Nigel Farage is shown in the cartoon as more akin to the insecure tantrums of Kim Jong-Un(hinged), and all in public circulation the day before Ukip’s anniversary, having been founded 22 years ago on 03-Sep-1993. Even his staggeringly dishonest and corrupt erstwhile fixer Douglas Denny has once again denounced him – such a pity Douglas Denny lacks the integrity and backbone to expose the truth in full; of the corruption, fraud, bullying, rigging and profligacy Nigel Farage has been so closely involved in, using useful idiots like Denny, John Moran, John Whittaker, David Bannerman, Mark Croucher, John Ison, David Lott, Annabelle Fuller, Mick McGough, Christopher Gill, Gerard Batten and the like as his mouthpieces and fixers. I guess it is hardly surprising that a little man like Denny lacks the backbone and ethics to tell the truth as he was so involved in the corruption and huge sums of money that seem to have unaccountably spiritted away (trousered?) by Nigel Farage and his direct cronies, that he may fear for his own liberty! It is quite surprising that in 22 years Ukip have achieved so staggeringly little, relative to the colossal amount of money they have had, for Britain other than the enrichment and patform Nigel Farage has achieved for himself and the enrichment of the unsavoury clique he has gathered around him to prop up his ineptitude as a politician, bereft of clear and sound, ethical and workable policies – dependent on populism – he is to Britain as Alex salmon and Nicolla Sturgeon are, just as Tony Blair, Gordon Brown, Jack Straw and thwe present leadership contenders are to the Labour Party – catastrophicly divisive. Even the media are finally plucking up the courage to point out that despite Ukip garnering just under 4M votes dotted around the country Nigel Farage is very much a ‘marmite’ character liked by a vociferous minority yet reveiled and held in contempt by the vaste majority – so much so that the General Election was, like all other domestic elections, an abject failure for Ukip and for Nigel Farage even more so having had his 8th. failure to get elected as an MP. His unpopularity is so dangerous and divisive for these United Kingdoms many now realise his involvement in the upcoming EU Referendum may well be the most damaging input to the Campaign to Leave_The_EU, causing many who would vote for the proposition to reconsider their stance and either abstain or vote against! I note in the Adams cartoon in The Daily Telegraph (Wed 2nd Sept), it is clear the news media have Nigel “sussed” exactly. It was always the danger of having a dictatorial leader that he would lead in a manner to enhance his own image rather than join in with the larger and far better organised ‘NO’ campaign for the greater good of the EU -OUT cause. By being so self-centred, by having no response or answers to the referendum in terms of party policy, by denying and ignoring the obvious fundamental changes which have now occurred in British politics with the announcement of the referendum, …this has adversely affected the very rationale of UKIP’s existence and what it stands for as per the UKIP constitution. It is clear Nigel Farage has not thought it out. UKIP’s very future as a political party is thrown into doubt: for what can UKIP do in British politics after the referendum? What then is the point of UKIP? I believe UKIP events have left UKIP behind, and as a party it has therefore now become defunct…obsolete. Nigel has never addressed the main issue which has always been the Achilles Heel of UKIP – what to do in the event that a government actually does give the British people a referendum for being IN or OUT of the EU. Such a referendum is precisely what I and most others in UKIP have been campaigning for in the last sixteen years or more that I have been inside UKIP, and longer outside of UKIP before that. The Conservatives having now conceded that crucial referendum have, in doing so, cut the legs from under Nigel and his non-policies, thereby crippling UKIP. UKIP did have a minor role to play in the lead up to the referendum – but only if the Leader Nigle Farage had accepted UKIP being a part of the ‘NO’ campaign – which will gain momentum in due course. He has foolishly rejected that for the sake of his own vanity, hence the NO campaign will leave Nigel and UKIP behind in it’s dust-wake as it forges ahead with good funding and high-powered people to speak on the ‘NO’ campaign’s behalf. 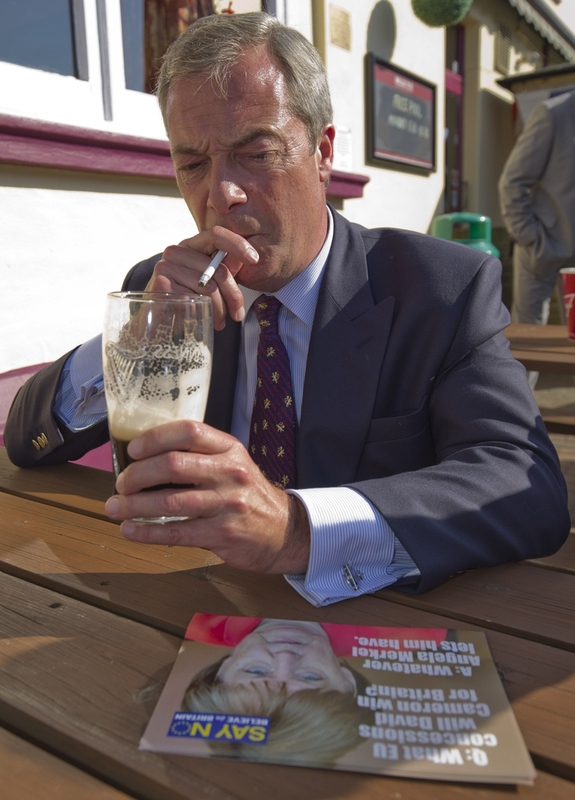 Nigel has cut himself and UKIP off from this vital role…. a very stupid decision in my opinion.